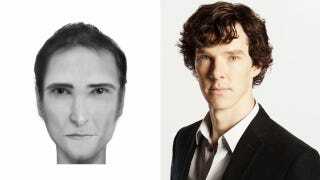 Which Sherlock Actor Looks Most Like This Police Composite Sketch? Brian Joseph Davis has been using police composite software to create realistic images of fictional characters based on the way they're described in prose. And his latest portrait, of Sir Arthur Conan Doyle's Sherlock Holmes, does look like some actors who have portrayed the character. His very person and appearance were such as to strike the attention of the most casual observer. In height he was rather over six feet, and so excessively lean that he seemed to be considerably taller. His eyes were sharp and piercing, save during those intervals of torpor to which I have alluded; and his thin, hawk-like nose gave his whole expression an air of alertness and decision. His chin, too, had the prominence and squareness which mark the man of determination. Of modern Sherlock Holmes actors, Benedict Cumberbatch looks a bit more like the sketch than Robert Downey Jr. or Jonny Lee Miller. But what about the older Sherlock Holmes actors? Peter Cushing? Jeremy Brett? Arthur Wontner? Which actor bears the strongest resemblance to the sketch?